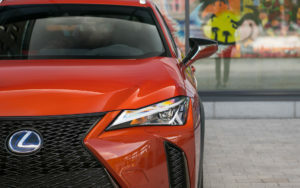 The notion that fortune favours the bold is certainly true when it comes to the 2019 Lexus UX, available at Lexus of Kelowna, as anyone who finds themselves behind the wheel of this bold new crossover can be considered extremely fortunate. 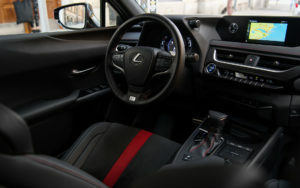 A luxurious interior, par for the course with Lexus, is overshadowed by the UX’s unconventional design. 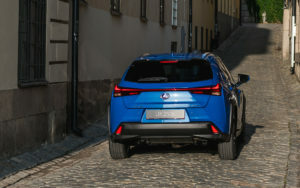 As aerodynamic as it looks, the avant-garde 2019 Lexus UX is sure to separate you from the crowd. With two different trim levels for the 2019 Lexus UX, you’ve got options when it comes to which model of Lexus’ groundbreaking crossover sits in your garage—although with this kind of curb appeal you won’t want to hide your new Lexus. The UX 200 is a high performance 2.0L inline 4-cylinder engine that delivers 168 horsepower channeled through Lexus’ new Direct-Shift continuously variable transmission, offering a more traditional driving experience to match the CVT’s smooth shifting. The UX 250H is a self-charging hybrid that combines the powerful drive you’ve come to expect from Lexus, with a 4th generation self-charging powertrain that provides unmatched fuel economy and a lower carbon footprint. A commitment to safety is part of what sets Lexus apart from the competition, which is why every 2019 Lexus UX comes standard with the Lexus Safety System+ 2.0. A collection of integrated active safety features like Pre-Collision with Pedestrian and Bicycle Detection in low light, All-Speed Dynamic Radar Cruise Control, Lane Tracing Assist, and Auto High-Beam offer added safety in all conditions. Intuitive Parking Assist with Auto Braking takes the guesswork out of busy parking lots, while the UX’s standard Blind Spot Monitor is like an additional set of eyes, ensuring your Lexus UX retains its unique exterior look. In the event of an accident, 10 standard airbags provide a safety net so that your most precious cargo stays safe. Great design marries function with aesthetic, and the 2019 Lexus UX puts this idea into motion. The crossover’s driver-centric front seat provides unparalleled ease of use as well as a comprehensive view of the road. NuLuxe seat coverings, standard Apple CarPlay™ and backup camera, as well as available wireless phone charging and heads up display, provide all the best benefits of modern vehicles without taking your attention from the road. Take your 2019 Lexus UX to the next level, with an F SPORT Series 1 or 2 package. Your Lexus will sport an exclusive mesh grille alongside 18” alloy wheels, to go along with the F SPORT styled interior, aluminum pedals, paddle shifters, and Active Sound Control. With a Lexus F SPORT package, your new UX is guaranteed to perform as sporty as it looks.